5:20 PM Mountain Time (yes, we have crossed into yet another time zone). The last couple of hours have been so exciting, I hardly know where to start. As we were on the approach to the cutoff for the Badlands, we noticed a storm brewing on the horizon. There was an exit for a scenic overlook, so we took that for kicks. At the top of the overlook we discovered a number of cars and trucks equipped with antennae, and we surmised that we’d stumbled on a group of storm chasers. We were right – they were all clustered together at the top of the overlook with their high-powered cameras, looking intently south. 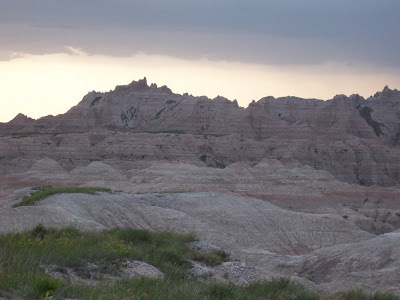 When we joined them, we could see what they were looking at – the Badlands about twenty miles distant and what looked like a funnel cloud forming out of the storming approaching it. 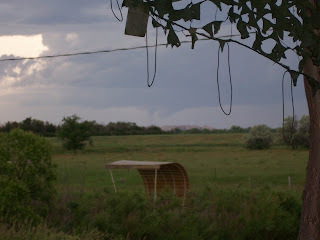 I had my binoculars and took a better look, and it certainly appeared to be a tornado. 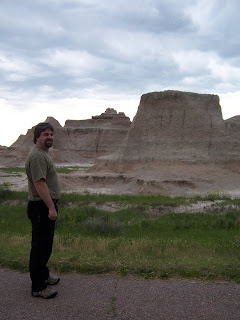 We watched for a bit, then got back in the car and headed a bit further west to the exit for the Badlands Scenic Route. While John gassed up the car at a BP station, I got the binoculars and looked at the approaching storm more intently. The tornado appeared to be roping out, then strengthening, then roping out again. Another cloud mass just behind it also seemed to be taking on a wedge shape. As I watched, one of the employees of the gas station shop came out to take a look. She told me that the BP station in the town of Wall had just called her because to them, it looked like the tornado was right on top of us. We watched as the funnel cloud changed its shape a few more times, then she went back in the store and I got back in the car. As John and I drove toward the Badlands, we could see that the storm was slow-moving, but looked like it would be quite severe. There were plenty of mammatus clouds in the sky, a sign of potentially severe weather. However, as soon as we hit the first scenic overlook in the Badlands, we forgot about the storm except as a backdrop to the amazing landscape. I was stunned at how weirdly beautiful the formations were. Even though the approaching storm had covered the sun, the strange sculptures seemed to glow with shades of terra-cotta, yellow and brown. The shapes were fantastic and surreal. Everywhere we turned was another amazing vista. Just then the storm chasers we’d seen at the overlook raced by, clearly in pursuit of a better view of the storm. 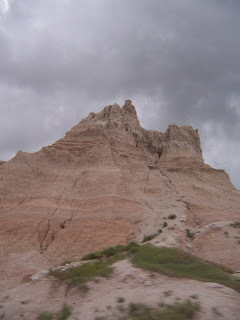 Lightning started to crisscross the sky and we got back in the car and drove further into the Badlands. It seemed like every fifty feet there was something wonderful to look at, so we kept getting out of the car for closer look in spite of the lightning and the thunder, which echoed like cannon fire through the canyons. 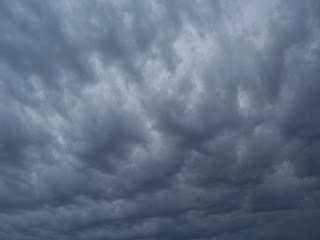 Meanwhile the sky grew more and more ominous, although I didn’t see any evidence of tornadic activity. We were cruising slowly past one scenic overlook when I caught a glimpse of a brown shape in the canyon. “A deer, a deer,” I cried to John, and he brought the car to a quick stop and backed up for a better look. It was a mule deer, and it gave us a long appraising look before bounding up the side of the canyon, pausing at the crest to look back. John and I eventually pulled up and parked at a footpath where you could walk and see replicas of fossils that had been pulled from the site. I don’t think we’d gotten twenty feet down the path when there was a particularly loud and vivid display of lightning and thunder, and we beat a hasty retreat back to the car as rain began to pelt down. We continued through the Badlands, pulling over to peer through the storm at landscapes that were no less amazing and beautiful for being seen through the rain. At one of the last scenic overlooks, we munched down some sandwiches I’d made earlier in the day. They seemed to taste extra good. As we left the Badlands, we were briefly pelted with hail and then a hard, steady rain. We drove north, leaving the natural wonders behind us and trading them for the silliness that is the equally famous and notoriously kitchy Wall Drug. We had our cup of “free ice water,” which has been drawing tourist to the spot for nearly eighty years. We bought a couple of magnets and a folder for the “squished penny” collection I’ve been keeping for years (and rapidly adding to on this trip – the Midwest is the squished-penny mecca of the U.S.). We shared a cup of vanilla ice cream and then got back on the road to our final destination – Hill City. We had originally hoped to go to the illumination ceremony at Mount Rushmore in the evening, but we were tired and hungry and have an easy travel day in front of us tomorrow, so we decided to go to Rushmore in the morning. We had a good meal at a place down the road, went back to the hotel and had a swim in the pool, and then went to bed. It was a wonderful day.